Do you arrive at the golf course hoping your A game will show up that day? Or do you have a system for making sure your concentration will be zoned in? Players who give consistent performances know how to fine-tune their minds. Here are ten mental strategies that can help you improve your concentration in golf. 1. Create A Pre-Zone Period: To get in the zone in the round, create the zone feeling in advance. At home, or away from the office, do 10-15 minutes of mental readiness preparation, including positive visualization, making a game plan, and positive thinking. Arrive at the course 20-30 minutes early to practice and gather yourself. When you have a strong mental game of golf, you will add this extra time to your golf experiences to guarantee your mind works for you, not against you. 2. Be Aware Of Nuances In Pre-Shot Routines: You may have a different pre-shot routine for various clubs and situations, so be consistent within each of those. Be aware when you alter these routines, and start over. When you have a strong mental game of golf, you will be more aware of these important subtleties. 3. Commit To The Shot: If you change your mind about anything on the shot, back off the ball, recommit and refocus on your routine. Picture the result you want in your mind and before you swing, let go of that image, and refocus on the ball. When you have a strong mental game of golf, you will have more mental discipline. 4. Accept What Will Happen, In Advance: Paradoxically, to get the results you want, you need to release your urge to micromanage these results during your swing. Players who are control freaks can't let go of their conscious mental control that makes their swing guided and tight. Instead, accept what will happen in advance, trust your swing and let it fly. 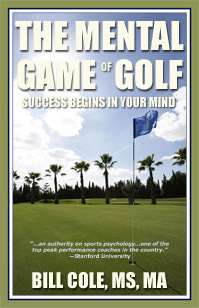 When you have a strong mental game of golf, you know that letting go paradoxically gives you more unconscious control. 5. Stop Evaluating Your Progress: Instead of riding the emotional roller-coaster of being excited when you hit a good shot, and depressed when you don't, try staying more emotionally even as you play. To do this, don't be consumed with how well you are doing or "If you will win". Instead, suspend judgment and take a "Let's see what happens" approach and simply keep your mind in the here and now. When you have a strong mental game of golf, you have more poise and patience with yourself. 6. Down-Size Your Vision: The closer you walk to your ball on the course the narrower you want your concentration. As you get over the ball you want a microscopic external focus, not a broad, internal or external focus. Look closely at the ink on the ball, any shadows, the grass around the ball, and let that help your mind become calmer and more tuned in. When you have a strong mental game of golf, you know how to use appropriate attentional cues. 7. Drop On-Course Self-Instruction: Your swing checkpoint lists and deep technical analysis that help you grow in practice just get in the way in a round, so leave them on the practice area. Stick to simple swing cues and quick fixes, and begin quieting your mind in the minutes before your round as you warm up. When you have a strong mental game of golf, you know that analysis and tweaking is best left for times other than the round. internal distractions, but you can cover them up. As you begin your pre-shot routine, listen to your breathing or hum a tune to block out these unwanted thoughts and images. When you have a strong mental game of golf, you know how to manage your mind, and your focus. 9. Use Performance Trigger Cues To Automate Your Swing: Use these to initiate the swing and then let them go. You can use words or images that convey smoothness, balance, power, ease or any other focus that helps you. When you have a strong mental game of golf, you make your mind an ally, by using smart triggers and cues. 10. Execute The Swing With No Mental Guidance Or Mid-Swing Tweaks: Your mind can initiate the swing, but don't let it guide or adjust the swing. You need to trust what you have initiated, and simply allow it to unfold. When you have a strong mental game of golf, you trust your training. I encourage you to make concentration a strength in your game. Follow these mental game strategies and watch your enjoyment go up while your scores go down. For a comprehensive overview of your mental abilities you need an assessment instrument that identifies your complete mental strengths and weaknesses. Here is a free, easy-to-take 65-item sport psychology assessment tool you can score right on the spot. This assessment gives you a quick snapshot of your strengths and weaknesses in your mental game. You can use this as a guide in creating your own mental training program, or as the basis for a program you undertake with mental coach Bill Cole, MS, MA to improve your mental game. This assessment would be an excellent first step to help you get the big picture about your mental game. Copyright © 2010 Bill Cole, MS, MA. All rights reserved. Here are a few of the testimonials from our Mental Game Of Golf coaching clients and participants in our golf workshops. or purchase the book from Amazon.com.